Interested in the Chinese travel market? Skyscanner data on searches and exits for users within the Chinese region reveals substantial growth. This is reflected in industry data which forecasts high growth rates (around 8.4% between 2017 and 2022); and forecasts expect China to become the world’s largest source of outbound tourism by 2022, with 128 million trips. China is already the largest source of tourism expenditure and this is anticipated to grow by a further 10.9% between 2017 and 2022. The core drivers of this growth in travel and expenditure are the emergence of a more affluent middle class, increased connectivity and the easing of travel restrictions. China’s per capita disposable income was up 8.8% in H1 of 2017, and forecasts expect that 400 million of China’s urban consumers will fall into the category of middle-class by 2020. Combining this with their appetite for outbound travel makes it clear that there are strong opportunities for future growth in China’s travel market. Whilst the China travel market offers great potential, Chinese travellers have unique needs, particularly when it comes to technology. In this market, mobile search, branded storefronts and seamless payment solutions are the norm in e-commerce. To successfully acquire Chinese users, an authentically mobile approach is needed; with purchases no more than a few quick taps away. A handful of airlines, including KLM and Finnair, have begun to shape their approach through the integration of WeChat. However, more is needed to offer a truly localised product that reflects user preferences. At Skyscanner, we are constantly working to adapt our offering and achieve product-market fit. In the Chinese market, this has meant introducing unique features such as our ‘inspirational feed’ on the Tianxun app. Knowing that many Chinese travellers only have between 5 and 10 days off each year inspired us to provide our users with ideas on how they could spend their limited time within their budget. We are also working to offer a retail model more in-line with the needs of Chinese consumers through Direct Booking. We expect the inviting ambience and content rich interface of the solution to improve usability and performance – especially on mobile. It is an approach familiar for Chinese consumers and has proven effective for Alibaba’s Tmall, which is actively used by 97% of Chinese online shoppers. It combines advanced search capabilities with content that makes it easy to assess and decide between options, whilst also giving each brand the opportunity to distinguish themselves on the platform. Additionally, the efficiency and simplicity of the Direct Booking shopping experience serves to add value – particularly in a market such as China, where seamless purchasing is so vital. As well as having strong preferences when it comes to technology, Chinese consumers have unique travel behaviour. Using our Skyscanner search and exit data, we have performed several analyses to provide insights into this behaviour, and how to tap into the opportunity that the Chinese travel market presents. The results of this are outlined below. 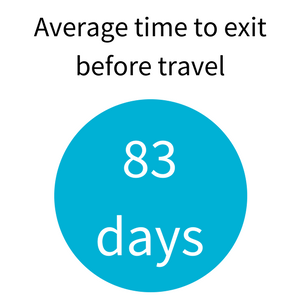 For all destinations with high search and exit volumes, we were able to identify the average time before the departure date when a search or exit took place. The results show that Iceland is the destination which Chinese users search and exit on furthest in advance; and that domestic travel results in searches and exits much closer to the travel date. 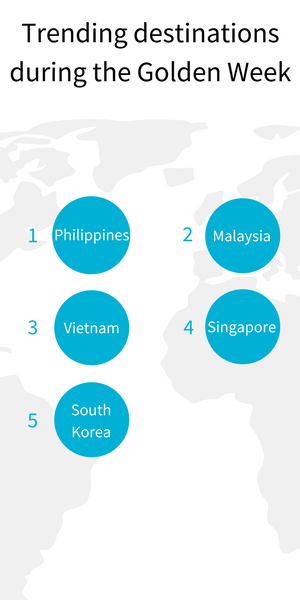 Based on both search and exit data, we have identified the top 10 most popular destinations. As well as being the most popular destination by both measures, Japan was the only destination within the top 10 to show strong growth between 2016 and 2017. 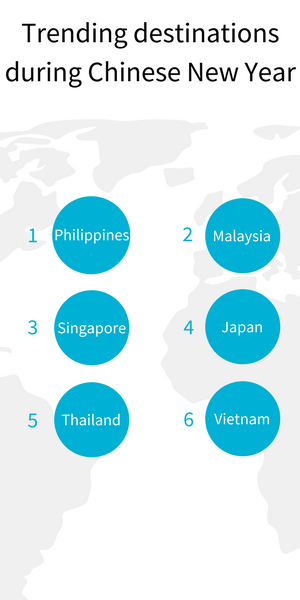 Outside of the top 10, other high growth destinations included Vietnam, the Philippines, and Austria for exits; and Vietnam, New Zealand, and the Netherlands for searches. Looking at how these searches and exits are distributed across devices, we can see that current searches and exits are predominantly made on desktop. However, looking at the change in the number of searches and exits made across devices reveals that mobile is growing at a much faster rate – nearly double – across both searches and exits. If growth continues at this rate, mobile will soon overtake desktop as the device of choice for Skyscanner users in China. Skyscanner exit data reveals substantial growth in the number of users in China that are travelling internationally during certain holiday periods. Most notably, Chinese New Year results in a 16% growth and the Golden Week results in a growth of 39%. We have also identified the most popular destinations during these time periods, and the destinations that experience the greatest levels of growth as a result of the festivities. Clearly, Chinese travellers on, and off, Skyscanner have a distinct set of preferences. Although popular destinations such as Japan are trending outside of China, there is a clear trend towards closer destinations (e.g. Taiwan and Hong Kong) for Skyscanner users in China. The industry trend towards mobile is also confirmed by our search and exit data, which reveals growth rates on mobile nearly double those on desktop. Clearly, businesses looking to engage with this audience need to take a mobile-oriented approach, which delivers on the expectations set by the m-commerce leaders of today (is content rich, offers a seamless payment solution etc.). To truly tap into the needs of Chinese users, however, more in-depth analyses are required to support the development of a localised strategy. With our Travel Insight data sets, there is the potential to conduct these analyses and identify: purchasing preferences, trending destinations, traffic leakage and more. Interested in finding out how Travel Insight can support your strategy?